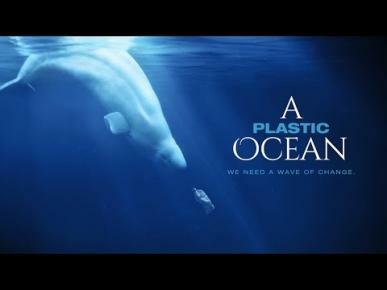 ECOZINE got the chance to attend the first Asian screening of A Plastic Ocean, hosted by the Asia Society Hong Kong Centre, and hear from the production team behind it. The documentary explores the fragile state of our oceans, uncovering alarming truths about plastic pollution and the threat it poses to human health, and critically suggests solutions that may be put into effect immediately to turn the tide. The film’s journey begins with director and writer Craig Leeson in his search for the elusive blue whale, who unexpectedly discovers significant plastic waste in a part of the world that should boast pristine waters. Teaming up with former BBC Blue Planet producer Jo Ruxton and World Champion free-diver Tanya Streeter, Leeson and his crew travelled to over twenty locations around the globe over the course of four years to document how deep our plastic problem truly goes. 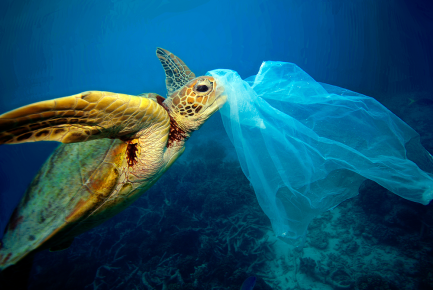 While the film’s chief concern is with the impact our overdependence on plastic is causing for the oceans, it naturally deals with the other repercussions that go hand-in-hand with it, notably the impact on developing countries’ ability to deal with such an enormous (and relatively new) amount of durable waste. Leeson’s team take us from the endless landfills surrounding the Philippines’ capital city, Manila, to the once idyllic lagoons of Tuvalu, some of which are now virtually drowning in plastic. For lack of a better solution, the plastic in these places is either edged to the sea causing irreversible damage to the ocean; or burnt on-site, causing irreversible harm to the inhabitants. The film also documents the trickle-down effects plastic has on human health more globally. Indeed, by compromising the well-being of our oceans we have effectively posed a threat to every level of our food-chains, as all life begins in the sea. A section of the film deals with how plastic (often in the problematic form of micro-plastics) once ingested by smaller marine life is then transmitted all the way up the food-chain, resulting in unprecedented toxicity levels in the seafood we deem ‘safe’, even in places renown for the quality of its products such as the French coast. They also expose the dangers behind using plastics in virtually all forms of packaging, showing that the chemicals associated with these are known to trigger hormonal-imbalances, above and beyond the obvious impact their usage has on our ecosystems. One of the more humbling and disheartening moments of the movie sees Streeter, one of the film’s narrators, coming to grips with the reality that while she can do everything in her power to raise her young son to be healthy, we live in a world where certain long-term risks are now beyond her control. 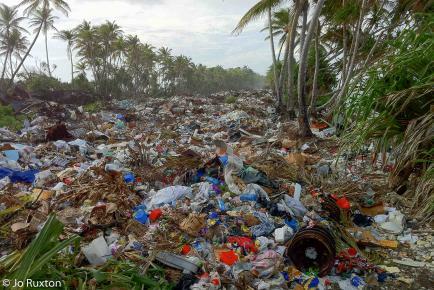 Some of the images are scarring, with unique footage documenting seabirds’ stomachs bloated with plastics, baby turtles ingesting plastic bags mistaking them for jellyfish, and children playing atop satiated landfills where they are forced to live both on the trash and off of it, forgoing school to forage for reusables so that their families can afford food. While the graphic shots and personal stories are perhaps the most impressive aspects of the film, Leeson emphasized the need for his expose to be couched in infallible science. In a Q&A after the screening, he recognized that big stakeholders – notably the industries profiting from an ever-expanding demand for plastic – have a vested interest in keeping such scientific findings at bay and will lobby against any claim that isn’t proven beyond doubt. To underscore the significance of the issue, and keeping with the science, the film cuts off at several intervals to indicate statistics of the damages plastic has caused since the screening began… and the numbers are often just as shocking as the images. Just when it seems like we’ve created a problem that we can’t surmount, the film changes angle and begins to look at substantial solutions, many of which have already seen tremendous successes in alleviating plastic pollution. The change of tone mimics Leeson’s personal experience and changing mindset whilst making the documentary, going from what he describes as moments of despair in his early findings to hopeful optimism, of which his colleague Huxton is full of. Together, they emphasized that the biggest shift needs to occur at the level of the consumer, because this change can be immediate. While politics and industry will have to change too, these take time and our oceans are running out of it. Their message resonates strongly with our upcoming Zero Waste Week (11-18 November), where we encourage everyone to get involved by making a pledge to reduce their waste. A Plastic Ocean underscores the fact that most of the plastic pollution comes from single-use items, and we’re reminded of this on a weekly basis through the work done by our partner, HK CleanUp. The pledge aims to get people more aware of the issue but also to show them how easy it can be to live without certain items, such as plastic cutlery, in the hope that pledgers will choose to continue limiting their waste by habit in the future. A Plastic Ocean will be available to the general public early next year, but for the meantime we invite you to get a taste by checking out the trailer. To find out more about the film, including how you can get involved in screening and promoting it, click here.